If drinking a warm glass of milk straight from the cow appeals to you, you're not alone. As many as 100,000 Californians alone swill milk straight from the cow without benefit of pasteurization each week, according to a March 2007 article published in "Time." You certainly can drink milk straight from the cow, but you might put yourself at risk for several diseases caused by bacteria normally killed by pasteurization, a process raw-milk advocates say diminishes nutritional content. The Centers for Disease Control and Prevention, or CDC, vehemently denies raw-milk fans' claim that pasteurization destroys the nutrients milk contains. However, around 20 percent of the milk's vitamin C content and 10 percent of its vitamin B1 is lost during pasteurization, according to the Encyclopedia of Science. Pasteurization might also destroy enzymes and "good" bacteria that aid in digestion and that help people who suffer from chronic intestinal illnesses such as Crohn's disease, raw-milk proponents say. Unpasteurized milk can contain bacteria such as E. coli, listeria and salmonella, all of which can cause potentially fatal intestinal illnesses. More than 800 Americans have gotten sick from unpasteurized milk products since 1998, according to the CDC. Listeria can cause miscarriage, fetal death or severe illness in a newborn if you contract it while pregnant. Typical symptoms of food-borne illnesses include vomiting, diarrhea -- which might contain blood or mucus -- abdominal pain, fever and flu-like body aches. Some groups of people have a higher risk of serious illness if the unpasteurized milk they drink contains harmful bacteria than others. If you're pregnant, elderly or have a compromised immune system, you have an increased risk of getting seriously ill. Small children might also have a higher risk of dangerous illness. If you're pregnant, avoid not only raw milk, but also soft cheeses such as Queso Blanco or Queso Fresco. Your baby might be affected even if you don't get sick from listeria. 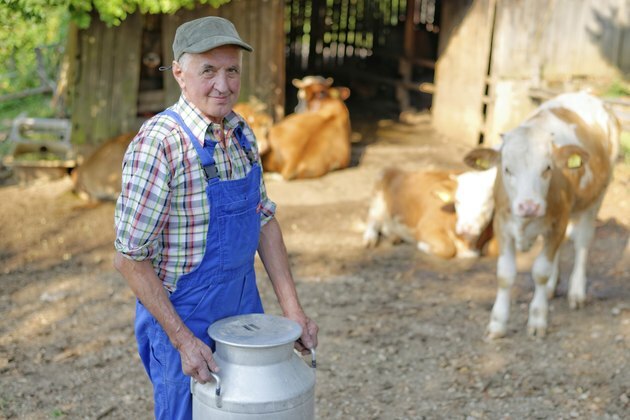 The U.S. Food and Drug Administration, or FDA, forbids the sale of raw milk between states, but individual states regulate raw milk sales within their own borders, with 23 states forbidding the sale of raw milk within their borders. If you own a cow or know someone with one, you can, of course, drink the milk without fear of arrest. Fear of serious illness, however, might keep that raw milk mustache off your face because the risk of contracting a dangerous infection is small but real.